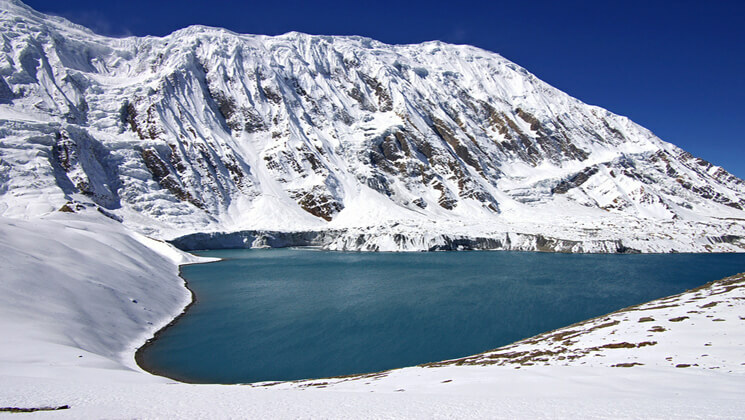 Tilicho Lake Treks is located at an altitude in 16,138 ft and undoubtedly provides some of the world’s finest views. Trek to Tilicho lake trek route has a great variety of culture and diversity, finest deep valley’s and high mountains encircling the giant Annapurna family view. Hike to Tilicho Lake is totally located into the Trans Himalayan Region in Nepal and Tilicho lake treks is technically not very difficult but because of falling dry landslides and stones the trail becomes dangerous sometimes. Furthermore Tilicho Lake Treks, you can see the settlements of diverse communities such as Brahmin, Chhetri, Tibetian sherpa, Thakali, Magars, Tamang, Gurung etc. Discovering Tilicho lake is the top first the most popular trek in Nepal. The trek rich in diverse culture and flora and faunas offers a great Himalayan scenery of Mt.Dhaulagiri (8,167m), Mt.Annapurna Ist (8,091m) Mt.Manaslu (8,163 m), Mt.Annapurna II (7,937 m.), Mt. Annapurna III (7,555m), Mt. Annapurna IV (7,525m), Mt.Annapurna south (7,219m), Mt. Nilgiri (7,041m), Mt. Hiunchuli (6,441m), Mt. Lamjung Himal (6,986m),Tukuche peak (6,920m), Tilicho peak (7,134m). Moreover, the tilicho lake trek cost for nepali is a foreigner is roughly the same but only the differences are about the conservation fees. Take a look our tilicho lake trek blog for all information about hiking routes to reach Tilicho base camp and lake. Roughly from pokhara to tilicho lake distance is about 51.3 kilometers which you can find in tilicho lake trek package. Tilicho lake in april is outstanding because of blooming colorful Rhododendrons. tilicho lake weather is not stable because of high mountain landscapes. tilicho mustang trek is also possible crossing over Tilicho pass but the tilicho lake temperature is still extremely cold. There are a lot of blue sheep and yaks grazing landscapes of its surrounding. If you want to cross Mesokanto la / tilicho pass then you need to have full equipment and ready to stay 1 night before Jomsom. So the best way is to descend downhill to Manang with the same trail and take a jeep downhill to Besisahar. Trek to Tilicho lake in winter season is not possible because of an icy trail and the lake is frozen. the rest of the time is always an outstanding trip to visit Tilicho lake. Hike to Tilicho lake lodge basis trek itinerary compared to most walks in this region. The particular route is designed for world travelers who wish to hike in Tilicho lake with relaxing manner Tilicho lake trekking – 15 Days itinerary however if you are planning with limited time wise than do follow this special itinerary. Day 2 Drive to Besisahar by bus (760m /2,485 ft), 7 hours. Early morning, guide will come to take your hotel at 7.00 am in the morning to pick you up. We have 7 hours of driving to Besishar, 185km far from Kathmandu. On arrival at Besisahar you will witness stunning snow caped mountain scenery. Overnight at Guest house. The trail drops steeply to Syange at 1070m from Bahundanda. Leaving Bahundanda a large waterfall may be seen. We, crossing the Marsyangdi River on a suspension bridge. We then follow the river to the stone village of Jagat before climbing through forest to Chamje at 1400m. Overnight at Guest house. Day 4 Trek to Bagarchhap (2,160m / 7,063 ft), 5 hours. The day begins with the rocky mountain trails following the Marsyandi Rivers steadily uphill to Tal at 1675m, the first village in the Manang district. We make a trail verse crossing a wide, flat valley. The journey continues up and down to Dharapani at 1890m. A stone entrance chorten typical of the Tibetan influenced villages. Upon reaching Bagarchhap at 2160 m the typical flat-roofed stone houses of local Tibetans design along with the village surrounded by apple Orchards and maize fields. Overnight at Guest house. The trail continuing through forest, but near the river, to Kopar at 2590m. As we reach the Chame, the headquarters of the Manang district, we are rewarded by the fine views of Annapurna II as you approach Chame & two small hot springs by the town. Along with this route we are introduced to a local community said to have migrated from Tibet a long time past, noticeable by their different features. With them, they have bought local Tibetan house designs and maintained their ways. Overnight at Guest house. Day 6Trek to Pisang village (3,300m /10,791 ft), 5 hours. The day starts through deep forest in a steep and narrow valley, crosses a river on a long bridge at 2,910m. Then we cross another bridge at 3,040 meters, from where the view of the soaring Paungda Danda rock face really begins to appear. From there the trail joins to climb to Pisang, which sprawls between 3,200-meter & 3300 m. In the late afternoon, visit upper Pisang for Managers and their lifestyles and as well as an amazing Himalayan view. Overnight at Guest house. Day 7Trek to Manang (3,540m / 11,576 ft), 8 hours. The trail leads you through the drier upper part of the Manang district, cut off from the full effect of the monsoon by the Annapurna Range. People of this region herd the yaks & raise crops for part of the year. They also continue to enjoy special trading rights gained way back in 1784. Leaving Pisang, we have alternate trails north and south of the Marsyandi River. The southern route to Humde, with its airstrip, at 10,906 ft. It involves less climbing than the northern route via Ghyaru, though there are better views on the trail that follows the northern bank of the river. From Mungji the trail continues past the picturesque but partially hidden village of Braga at 3,475 meters to nearby Manang at 3,540m. Overnight at Guest house. Day 8 Discovering Gangapurna glacial lakes and hiking around Manang. Acclimatize day in Manang. Hiking and village excursion are not compulsory, however, we recommend you to spend doing some fine walks milky blue Gangapurna glacier lake at the foot of spectacular Gangapurna ice fall, gangapurna hilltop for a better view of whole manang village. You can explore Milarepa Cave if you like. Overnight at Guest house. From Manang the trail descent to a Chorten and turns to northwest and goes down to the River. After crossing the Jharsang Khola on suspension bridge the trail goes through blue pine forest and the wheat fields before arriving Khangsar, Khangsar is a Gurung village. There you find a small monastery, Chorten, Mani walls and prayer flags. Stay overnight at camp in Khangsar. Day 10Trek to Tilicho Base Camp (4,150m / 13,612 ft), 4:30 hours. From Khangsar the trail climbs steeply past the Gompa and small chortens, trail goes through juniper and sea buckthorn bushes. Along the way we will cross the few streams and climb steeply to arrive Tilicho Lake,from here we can enjoy the closer and panoramic views of Tilicho Peak and surroundings mountain. Overnight at Tilicho base camp guest house. Day 11 Trek to Tilicho Lake (4,919m / 16,134 ft). Descend to base camp, 5 hours. Start the trekking early morning today to Tilicho lake, it 4 hours working to the lake we can have outstanding view of Gangapurna, Tarkekang, Khangsar Kang and the view of Manang valley and Upper Pisang are great, after spending the memorable time at Tilicho lake. Visiting Tilicho, we descend down to Tilicho base camp via the same way for overnight stay. Day 12Trek from Tilicho base camp to Manang (3,540m / 11,576 ft), 6 hours. From base camp we trek down passing through the ruins of old Khangsar and follow an unmarked/ very thin trail which will leads you around and down to cross the river bridge to Manang village. Stay overnight there. Day 13Drive downhill to Besisahar, 9 hours. A very tough and long day drive out from Manang to Besisahar. It takes roughly about 9 hours and we stay overnight at Guest house. How much does the Tilicho Lake Treks cost? Hike to majestic Tilicho Lake trek is available now on USD 1,180 per person is standard trek price on double occupancy basis. In this price, we offer you Tourist Standard accommodation in Thamel, Kathmandu and of course the trip price will vary according to group size. Taking flights to and from Pokhara saves your time and riding bus reduces the trip expenses. For the deluxe and luxury trekking tour plan, we add Kathmandu – Pokhara – Kathmandu round trip airfare, 3-star category hotel deluxe air-conditioned room in Kathmandu (BB PLAN) with attached bathroom while on trekking on possible places, so let us know. AND WE ARE OPEN TO CUSTOMIZE YOUR TOUR AND PACKAGES PRICE AS PER YOUR REQUIREMENTS. International tour leaders are highly encouraged to get discount and attractive complimentary. Bus transfer from Kathmandu – Besisahar & from Besisahar – Kathmandu. We can organize private trip to Express Tilicho Lake Trek starting at any date that works for you. Please contact us for more information. Question: Do I need the experience to do express Tilicho lake treks ? Question: What kind of accommodation can I expect on Tilicho lake hiking? Question: What kind of food can I expect in Tilicho Lake Treks? Question: What opportunities will I have for shower along express Tilicho Lake Treks? Answer: Guest house trekking along the routes they have shower which you can get it somewhere paying and somewhere without paying however if you are in camping trekking – we provide you hot water bucket then you will take bucket shower. Question: How do I get drinking water on Tilicho Lake Treks? Answer: During the tilicho hiking route, there are all places hotel and shops where you can able to buy mineral water and you can buy it for drinking but however we advise against buying mineral water in plastic bottles, as currently there are no provisions for disposing of these. Instead, we provide you with boiled water or bringing chlorine tablets to purify the normal water as the normal water is available in campsite/along the way. Question: Is there any communication facilities on Tilicho Lake lodge Trek? Question: Who will carry my luggage on Tilicho Lake express trek? Tilicho lake, Nepal’s highest lake offers turbulent river gorges with nice waterfalls. Mystical Manang valley offers awesome view of whole Annapurna massive. This trek itinerary is subject to change due to a condition beyond our control. This is a Guideline showing tentative camp night stops. Physical, technical and natural condition may change this above itineraries.